Fords Magazine / Hot Right Now / Is WeatherTech really worth it? When looking for aftermarket upgrades for your work truck, a lot of people start with rubberized floor mats. Rubberized floor mats do a great job of protecting the carpeting in your truck while providing a great surface to deal with the inevitable dirt and water you’re likely to encounter on the jobsite. 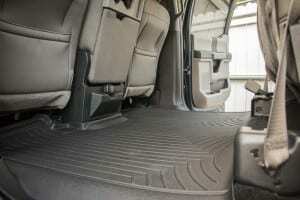 We opted to try out WeatherTech FloorLiner DigitalFit Floor Mats as they come highly recommended and are a very common choice for Pros looking to outfit both new and used pickup trucks. When you install a high quality rubber floor liner you not only make sure the inside of your work truck is protected, you also add value to it by ensuring that the interior stays clean—or at least remains cleanable. While premium carpeted floor mats are certainly an option, going with a product like WeatherTech FloorLiner DigitalFit Floor Mats makes more sense as it delivers a superb amount of protection against mud and debris. When you work out in the field, it’s not uncommon to drag bits of concrete into the cab—that’s like dragging rock along your carpet. It won’t take long before you’ve not only dirtied those mats, but you’ve torn them to shreds. Rubberized floor mats offer something a bit more robust. The WeatherTech FloorLiner DigitalFit floor mats cover your interior carpet and cover the front, back and even the sides of the footwell of your truck. WeatherTech actually took digital laser measurements of the interior surfaces of various trucks, so all of their products are guaranteed to fit. They use a High-Density Tri-Extruded (HDTE) material that has a strong rigid core with a base that delivers some friction so that the mats don’t move around. The surface is nice and “grippy” as well, so when you place tool boxes and items down on the mat they don’t tend to slide around…unless you corner like a NASCAR driver. The WeatherTech FloorLiner DigitalFit floor mats are designed with surface channels that carry liquids and even debris to lower points on the mat. That keeps you from having to deal with standing water and also enables you to move easily clean and remove dirt and liquid from the mat’s reservoir. The front driver-side WeatherTech mat also has a secure plastic button that snaps the mat into place so it doesn’t move—giving you stability when you drive. For the front mats you can choose a single mat that spans the entire front of the truck—including the center hump, or you can install two individual mats for the driver and passenger sides of the cabin. Because the individual mats are easier to remove and clean, we opted for those—you’ll have to decide which is best for your needs. For the rear of our Ford F-150 work truck we used the full-width system that delivers a perfect cover for the entire rear cargo area of our Super Crew cab. When you flip the seats up you end up with a storage area that’s the size of a small apartment—OK, perhaps it’s not quite that big, but there’s certainly a lot of room. What I love about these WeatherTech floor mats is that they take into account that entire space, so that no matter how you use it—you’re covered…literally. With the WeatherTech rear mats installed, we now have a work truck that has a rear cab completely protected against wear and damage from mud, oil, and other liquids or abrasive materials. The price for the WeatherTech FloorLiner DigitalFit Floor Mats ranges from $199.90 to $229.90 depending upon the size of your truck cab and whether you want the full width or individual mat options. For more information check out the WeatherTech website. There are currently no comments on Is WeatherTech really worth it?. Perhaps you would like to add one of your own?